Rose Plant Issues – All Help Appreciated!! 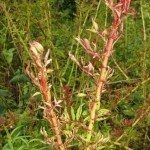 I am a new rose gardener and have been looking all over the web to locate pictures to identify diseases of my roses to no avail. I am concentrating my roses into the areas near the house so I can watch them each day for deer (and enjoy the blooms, of course). I am spraying all with 'Liquid Fence' deer repellent approx every two-three weeks, and am planting lavender around entire perimeter to help keep deer away. There is enough space between roses for plenty of air circulation, and I am watering at ground level to avoid adding water to leaves. We have enough rain here in PNW. (1) I have one with sort of crinkled up leaves; however, it is not yellow, light green like rose mosaic pictures I've seen. It is blooming well. Foliage is dark green; new growth looks fine, then turns crinkly as matures. This problem appears each year. Variety? Sharifa Asma? (2) Another one has black spots (larger, and only a few spots on the affected leaves - probably 60-70% of leaves affected) every year. Variety? Yellow climber, no scent. (3) I have put quite a bit of diatomaceous earth around them and have begun spraying them with a sodium bicarb, horticultural oil and water solution once a week. First time was last Thursday. (4) Some of the new roses (planted March 23, 2011) seem to have something eating large holes in leaves - not on edges of leaves (started near ground level, working their way up plants); one has dark/black thin edge around leaves which otherwise look fine. I have noticed a few aphids on buds on one bush so will begin spraying garlic oil spray also. All help in identifying culprits and suggesting treatments greatly appreciated!!! Sounds like your roses are healthy over all. 2. Black spot, lovely stuff. Make sure you clean and clear your rose bed as throughly as possible. Black spot is an air borne fungus. When those contaminated leaves fall off the fungus gets into your ground. When it rains the fungus gets splashed back on your rose. That's why it keeps coming back. I found the best, most effective method to use on mine was corn meal. No I am not crazy, the corn gluten is a suppresent. I live in Virginia the black spot capital of the world. Since starting to use the corn meal, I no longer have black spot for the first time in 25 years! I liberal cover both my roses and my beds with corn meal. 4. Sounds like aphid damage, I prefer to hose them off as much as possible, but the garlic oil works well.